In the absence of a greenhouse, we have to protect our little seedlings from the night-time chills the only way we can – by inviting them to live with us. A kitchen windowsill would be ideal, but our kitchen is north-facing and gets no sunshine; we’ve previously tried growing herbs here to no avail. So the little tykes end up monopolising the one permanently sunny spot in our house – the window seat in our living room. 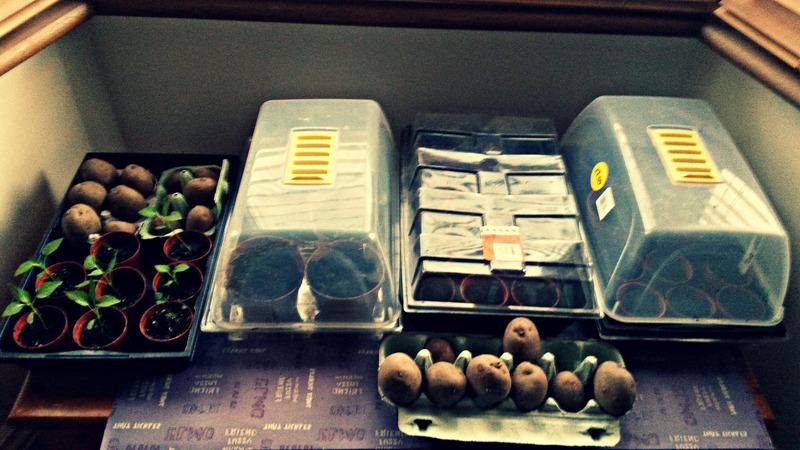 That’s right, in our living room, we’re currently growing potatoes, peppers, tomatoes, cucumbers and celeriac. The window seat is all theirs. If this kind of mollycoddling doesn’t ensure a delicious and plentiful crop, I don’t know what will. Been there, now got a greenhouse. Will say my debate is about heating the greenhouse now rather than which room they will occupy. Wow! you got some healthy looking plants there! Out of interest, did you plant all the tomato seeds in the packet? i did but have now ended up with 200 tom plants!! i dont know if im just lucky that they all germinated, or too enthusiastic!